German retail power rates are high, but industry electricity prices are low. A recent comparison of countries bordering the Netherlands reveals what an outlier Germany is. Craig Morris investigates. Around the world, households pay higher rates for electricity than industry does. One reason is that bulk power purchases generally make item prices cheaper. But there is another reason not talked about enough: until recently, small power consumers have been captive. A century ago, industrial firms were able to make their own electricity. Power providers needed to undercut those in-house generation prices to win over these big customers. The margins were slim for utilities in this sector, but greater returns were possible from smaller consumers, who did not have the option to make their own electricity. That situation is now changing, especially with the advent of solar rooftops (increasingly with battery storage). Because German retail rates are so high, the price of solar power from a rooftop reached the retail rate (the point of “grid parity”) in Germany in 2012 – despite the country’s relatively poor solar conditions. In a comparison of power prices for the Dutch Economics Ministry, analysts at PwC found (PDF in Dutch) that Germany is an outlier. Far more than any other country, German power firms get most of their profits from small power consumers. In the chart below, we see Germany, the Netherlands, Belgium, France, and the UK. German power rates are clearly higher in the smallest four categories, but by the time we reach industrial prices the rates are cut in half, and Germany is suddenly the cheapest. One outcome of this situation could be massive grid defection; small consumers have a tremendous incentive to switch from grid electricity to their own solar roof. This trend may eventually kick in, but it is not happening yet. This year, Germany is expected to install just half of its annual target. One reason is low home ownership; many Germans prefer to rent and put savings into their pension plans. Tenants will have a harder time going off-grid because they don’t own their roof. One option would be for third parties to build on such roofs and sell electricity to the tenants, but the German government postponed the profitability of this business model by imposing the full renewable energy surcharge – thereby adding 6.17 cents to each kilowatt-hour. Systems larger than 10 kilowatts (roughly 3 times bigger than a household array) might be found on small and midsize businesses, but the German government has also imposed part of the renewable energy surcharge on such solar electricity. As a (probably intentional) result, the profitability of switching from grid electricity to solar roof arrays has been pushed back a few years. But if you want to know how to bring solar to a halt, study Spain. Its new policy aims to make battery storage for solar unprofitable for the near future. In the first five months of 2015, not a single solar panel was installed in Spain according to official statistics (Excel file in Spanish). A few years ago, grid parity was widely held to be the point where solar would grow unabatedly without policy support, but clearly those analysts failed to understand that protection from a backlash will always be needed. 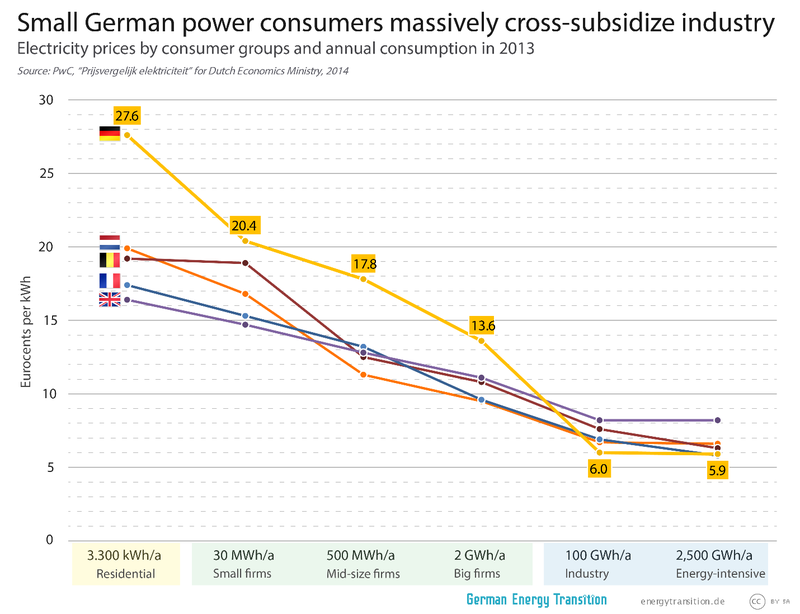 Not everyone is happy about small power consumer’s cross-subsidizing industry in Germany, incidentally. In 2014, the EU looked into the situation in Germany. Many of us hoped that Brussels would force Berlin to scale back these industry power subsidies. After all, wholesale rates have dropped by around one cent in recent years, so big industry already benefits from lower power prices. Unfortunately, the final outcome was disappointing – the industry exemptions to the renewable energy surcharge fell from 5.1 billion euros to 4.8 billion (press release in German). For the time being, small German consumers continue to cross-subsidize the country’s biggest power consumers, while German policymakers have taken the first steps towards keeping these small customers captive – with the imposition of new fees that make switching to solar less financially attractive. And it probably never will, for two reasons. First, to live off the grid you need batteries which would add a very high costs. Two, even if you have batteries, sunshine in Germany during winter is only 5-10% of its summer peak. There is not enough power to run home appliances or charge batteries. You need either grid connection or some kind of generator to supply your household during winter. Wrt http://www.pennenergy…, I do believe that this is a project in Hawaii, at 21 degrees North latitude. Can someone refer me to websites which explain how the impressive industrial bases of Bavaria and Baden-Württemberg will make it through the winter on roof-top solar alone? Sometimes I think it is not a joke when people suggest that in 2020 the CSU will suddenly announce that a 5 year extension of nuclear power production cannot be avoided. Your link to Pennenergy doesn’t work. Rhetorical questions (“Can someone ….”?) are not asking for an answer.Only for a similar quality: Yes.